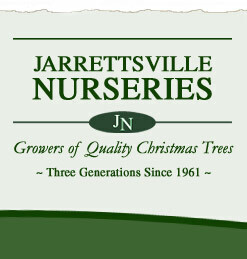 If you want a Christmas tree that can live in your yard, buy a ball-and-burlap or container tree. Purchase your tree as close to Christmas as possible and keep in indoors for as brief a time as you can. You can keep it indoors for 7 to 10 days if you give it a cool spot near a window. In cold-winter climates, dig the planting hole in late fall, before the ground freezes. Make it twice as wide as the root ball will be. Then, fill the hole with mulch and protect the excavated soil with a tarp. When you buy the tree, place it in a garage or a shed for a few days to adjust to the warmer air. Display it in a watertight tub and place ice cubes on top of the root ball as needed to keep roots barely moist and cool. After Christmas, acclimate the tree to cooler air by placing it back in the garage or shed for a few days. On a mild day, place the tree into the hole. Backfill with excavated soil and tamp gently. Water deeply, then mulch heavily. In harsh climates, evergreens are vulnerable to wind damage during their first winter. Protect your tree with a screen.